My name is Tyger Gilbert. I’m a writer, artist, photographer, web designer and programmer, and I live in Phoenix, Arizona. I’ve been here since right after dirt was invented out in the Sonoran Desert and I’ve seen a lot of things happen over the years. I’ve been blessed and cursed with an IQ that is in the top 1% of the population, and it has made me see things very differently from most people a lot of the time. Because of this, I’ve felt like an outsider looking in for much of my life, but by a great deal of introspection, I have come to realize that a lot of people feel this way about many aspects of their lives, too. My ongoing fascination with philosophies of the world throughout history has also produced unexpected but valuable conclusions on common perceptions and how things really are. You and I probably agree on a lot of thoughts, attitudes, and beliefs about how the world is being run these days. I get really angry when I watch the nightly news or read about all the wars, the hunger, sickness, and protests all over the globe. I feel so helpless that I can’t do anything to stop all the pain and suffering I see. I am very disappointed that none of the prominent religions seem to provide answers to these problems, and in fact are often the cause of them. I get frustrated by all the promises made by politicians everywhere who say they will find and implement solutions, but never do. I suspect you often feel the same as I do about these conditions. The world is still rampant with wars, hunger, violence, and sickness even in this modern age. If you do feel upset by these things, I hope you will help me with this book I’m writing that I believe provides workable answers and reveals ways you or anyone else can put them into action to benefit a lot of people. People you love and want to see happy. And you will be able to use these revolutionary new concepts that I describe to achieve your own personal freedom as well. This book is the culmination of many years of philosophical analysis and soul searching for me. I disagreed with much of what I was taught by my parents and teachers in school because it just didn’t make sense to me. I struggled with that most of my life until just a couple years ago when I realized that most everything I had been taught was wrong! And it was not that my parents and teachers and everyone else meant to deceive me, it was that what they were taught and believed is not how things really are, not then, and surely not today. Civilization favors the wealthy with power, privileges, and opportunities. I now recognize that civilization is structured in ways that are inherently corrupt and immoral. It openly favors only select groups with power and privileges while sentencing the bulk of humanity to virtual slavery, requiring them to suffer a basic, minimal existence in order to support and serve the interests of the wealthy. Creative thought and individuality are suppressed in favor of the opinions and the dictates of the ruling elite. Elections change who makes the rules of the game of Life, but they never significantly alter how the game is played. Those who benefit from this arrangement do not want to see things be any different, but if you are like me, the way many things are being done just isn’t right to you. How to fix those things is surprisingly simple, however. Most of the world’s population lives in abject poverty. Religion and politics have failed to provide workable answers to the problems of wars, violence, sickness, starvation, and most other forms of human misery for more than the last 2000 years. I say it’s time to start doing things differently and choose some alternatives to these institutions. All the governments and different religious belief systems cause more pain and suffering in the world than they cure or prevent. They create lots of impressive buildings, but despite their best efforts, neither has adequately provided what is really needed for anyone but the rich and powerful. With the world’s population at over seven billion and growing exponentially, the problems quickly will get far worse than anyone can imagine. Governments and religions have built lots of big fancy buildings, but haven’t ended human suffering. Air pollution, a lack of clean water, trash everywhere, the destruction of natural forests, changes in climate and weather, crop failures, extreme overcrowding, and vastly inadequate food supplies are devastating the human condition today, never mind what horrible things will likely happen in the future. Though science and technology have made some people in advanced countries more comfortable and extended their life expectancies, the incredible, senseless suffering of humanity continues throughout most of the world. Why? Overpopulation is destroying the environment everywhere throughout the world today. The reasons are rooted in the very nature of the human species. Civilization was founded on the formation of groups and the use of these groups to control and develop resources for the benefit of the group. Leaders of groups wanted to exert control over the thinking and behavior of individuals in the group so they could ensure they got the results they wanted. Loyalty was essential, and dissent was overcome by the use of force. Apparently, leaders today don’t see how these ways aren’t working well in modern times, as they persist in trying to use bigger and bigger groups as their tools for everything. Politicians . . .You see one, you’ve seen them all . . . because they all are essentially the same. The right solutions to these problems will come from placing the needs of the individual above or equivalent to the needs of the group, and from recognizing and valuing individuals as being important to everyone. Control of actions and motivation to perform for the benefit of a group must come from within each person. Good thoughts and behavior can not be externally imposed by group rules which require compliance through threats and intimidation and the use of actual physical force. That just fails miserably in so many ways. Good thinking and behavior cannot be imposed on others through the use of force. This book describes the philosophy of Individualism for true personal freedom and provides practical ways to implement it in a society that is brainwashed to socialism and total control by governments at all levels. It emphasizes the necessity for voluntary cooperation – not compulsory obedience – to satisfy the needs of civilization at large and fulfill the desires of every person in it. The logic and morality of the methods advocated are substantiated with examples from the ways the world currently works and are demonstrated to be realistic. They aren’t just ideas I came up with all by myself. Several well-known and respected philosophers and writers like Henry David Thoreau, Ayn Rand, Max Stirner, William Godwin, and Benjamin Tucker have all embraced Individualist beliefs and have been a great inspiration to me. Slavery was once condoned by various governments but it is now illegal and unacceptable everywhere. This major change in social values didn’t happen overnight, but gradually people realized the horrible immorality of it and now consider it an extremely reprehensible practice. New concepts like “voluntary taxation” or “free participation” are rejected by many people as being unworkable because equal contributions and the allocation of benefits cannot be enforced, and the redistribution of wealth cannot be directed and controlled by the politicians. Yet, these methods are in use in many places in many ways today and are actually quite feasible for making good things happen. Their perceived weaknesses are actually their strengths that make them fair and usable for everyone, not just the powerful. Slavery was accepted for most of human history, but attitudes about it have changed drastically. Crowd funding is an example of how projects can be financed voluntarily and without the use of force. Instead of some politicians or bureaucrats, the people who are providing the money are the ones who decide which projects are funded and get done and which do not. Can you imagine if citizens could directly decide what their government taxes would support? A lot of wars might never be started, never mind go on for years and years. Revolutionary ideas like these can be implemented right now by injecting them into the functionality of governments and large corporations the world over and eventually will prove to be more equitable and humane ways of handling the interpersonal relationships of people than direct force and coercion. No matter what your political or religious beliefs are now, these universal concepts will work for you. People everywhere are happier when they can choose what they want for themselves. It’s time to move from an authoritarian-based society, one that imposes rules and causes damage and suffering when it enforces laws with strict penalties for non-conformance, to a society that is peer-based and works well because it is built on values and sound principles. This will motivate people to participate and perform in ways that are good for everyone. People are happier and a lot more productive when they do things because they want to, not because they have to do them. The freedom to choose is what enables this, and making the game a win-win-win situation is how multiple beneficial choices are created for every player in the game and success becomes the only alternative. The ability to communicate, spread ideas, and change attitudes has never been greater than now. I don’t expect to “save the world” with this book, but I can help point the way toward a better way of living for a lot of people by influencing how they choose to value themselves, other people, and Nature itself – by simply “changing one attitude at a time.” Great ideas, when successfully put into action, will spread faster today than at any other time in history, and they can quickly become the accepted way of thinking. I’ve been working on these concepts for a long time, and the details are finally coming together. With the popularity of social media and networking at a high point, the precarious state of the global economies, and general dissatisfaction with all forms of governments now, I believe it is the right time for this book to have a meaningful and significant positive impact. It will take more than hoping and praying to bring about significant changes for Humanity. Wishing things were different won’t change anything. The human race is in a desperate situation. It will take some effort by everyone who recognizes action is needed before it is too late to have any meaningful effect. Don’t just keep making the same mistakes over and over, letting someone else decide and control your life, all so you can barely get by while they become more wealthy. 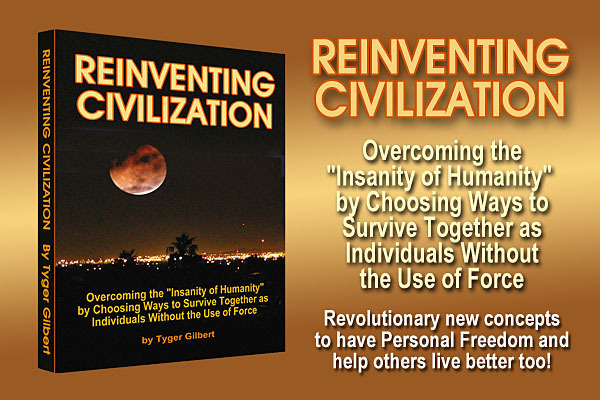 Join me NOW and help make this book become a source of inspiration and guidance to stop the march of all of civilization toward the extinction of mankind. The time is right for this – it needs to happen NOW! Please contribute what funds you can today, and then give me your opinions and criticisms as I complete the writing of this very important book. If you like this presentation, which is a good example of how I think and write, and if you agree with even half of what it says, you will love the book. It will be much more comprehensive and include lots of examples of how things can be improved and even drastically altered for the good of everyone by making only small but significant changes to how things are structured and done. I assure you that you will be glad you contributed to it and proud you were a part of its creation.